Lauscha glass is legend! It's smooth, resists boiling, and doesn't scum! Stiffer than the Italian glasses, it's excellent for sculpting and detail work. Your decorations won't contract into unrecognizable blobs....the glass will stay where you put it!!! Hand pulled in small batches, you'll see why all the world loves Lauscha glass. For over 150 years, Farbglashütte Lauscha has provided the flameworking community with the finest colors and quality. 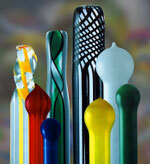 Our assortment packs provide hours of fun, with a wide variety of colorful rods. Get yours today!